Union surgeon James Dana Benton witnessed firsthand the suffering and death brought about by the ghastly wounds, infections, and diseases that wreaked havoc to both the Union and Confederate armies. A native of New York, Dr. Benton penned a series of letters throughout the war to his family relating his experiences with the 111th New York Infantry as an assistant surgeon, and later with the 98th New York as surgeon. 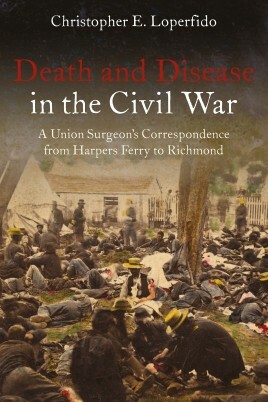 His unique correspondence, together with insights from author Chris Loperfido, coalesce to produce Death and Disease in the Civil War: A Union Surgeon's Correspondence from Harpers Ferry to Richmond. Dr. Benton was present for some of the war's most gruesome and important battles, including Gettysburg, Cold Harbor, and the siege of Petersburg. He was also present at Harpers Ferry, Second Battle of Auburn, Battle of Morton's Ford, and Abraham Lincoln's second Inaugural address. His pen offers an insightful and honest look into what everyday life was like for the surgeons who tirelessly worked to save the men who risked their lives for the preservation of the nation. Loperfido's Death and Disease in the Civil War should be read by every student of the Civil War to better understand and come to grips with what awaited the wounded and the medical teams once the generals were finished with their work.